Thanks Julia. Perhaps "Quirks" is a very nice way of saying non-standard :), and I thank you for appreciating the point, and being positive. Standards/rules are there to be broken. Creating a software application that's "easy" to use, is much harder than making it "hard" to use, but easier for the developer. For example, with my App, there is no SAVE AS. It all works fine in the "context" of "MY" application. "quirky/non-standard" DOES NOT = WRONG!. · Don L likes this. @SteveKelepouris Standards/rules are there to be broken. I'm not sure I'd go that far, but I will say I've lost track of the number of times I've had a client request I do something to a UI that IS "non-standard" because they feel it is easier for them to understand and use. · Tim P and Steve K like this. No the temperature must be expressed as "C" and "C" is spelled out as degrees celsius. In the scientific world where papers are submitted to peer reviewed journals, degrees Kelvin is K, degrees Fahrenheit is "F". The sign of degree ° is reserved for angle. The official International System of Units abbreviation is g, but gm has also been used. Thanks Alfred, looks like just "C" is correct. I'll remove the ° symbol. I didn't like the look of it anyway. The SI-Unit of “gram” should be “g” as “gm” means “gram-metre” you might not wanna use “gm”. Shouldn't it be 'Gross Mass' instead of 'Gross Weight'? @Robin L-Mitchell Shouldn't it be 'Gross Mass' instead of 'Gross Weight'? There is a basic difference, because mass is the actual amount of material contained in a body and is measured in kg, gm, etc. 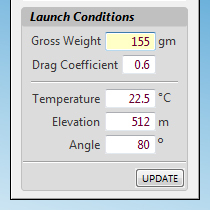 Whereas weight is the force exerted by the gravity on that object mg. Note that mass is independent of everything but weight is different on the earth, moon, etc. In my case, the user must weigh the various components (on earth) using a weighing scale. The total weight of each components is the Gross Weight. I suppose in space you would use mass instead. Technically mass, but most people are more familiar with weight. Interestingly in the example above, gm is used for gram. @SteveKelepouris : thanks for that giggle. Needed it today. Is this from the fifties? @Beatrix W @SteveKelepouris : thanks for that giggle. Needed it today. Is this from the fifties? The book was first published in 1965. 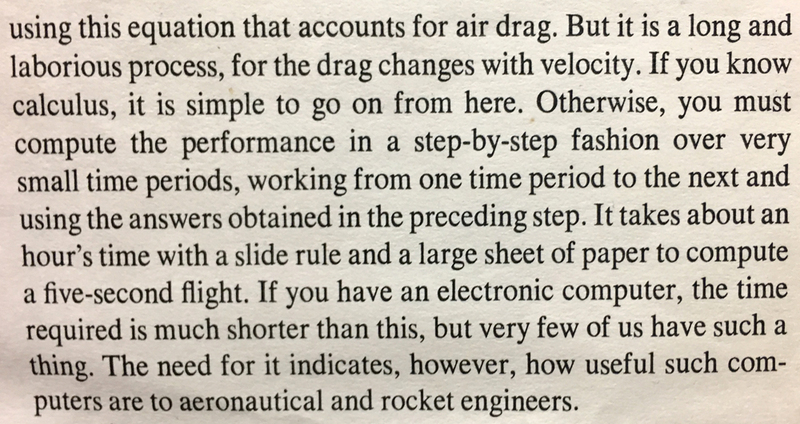 I don't have the entire book, just a photocopy of the chapter regarding altitude calculations. Photocopied from a library book in the early eighties. This was before I purchased my first PC (IBM/XT). Before that I had a programmable calculator - a real pain. The book is regarded as the bible of model rocketry and the official handbook of the National Association of Rocketry (US). @Alfred V;Hoek No the temperature must be expressed as "C" and "C" is spelled out as degrees celsius. In the scientific world where papers are submitted to peer reviewed journals, degrees Kelvin is K, degrees Fahrenheit is "F". The sign of degree ° is reserved for angle. Celsius and Fahrenheit are degree units. These have always the sign of degree. See wikipedia Celsius , wikipedia Fahrenheit . Kelvin is a SI base unit an and you write never a degree sign with Kelvin (wikipedia Kelvin )! · Derk J and Ulrich B like this. @Thomas E This is just wrong. Yep. Righto. I wouldn't go as far to say it's "wrong", but I accept it, and have changed it back to include the degrees symbol. The reason I've done so is because, yes, I agree that it IS actually the correct way to show it. Thankyou. That's not to say that just using C/F/K to describe degrees is unclear, but in this case, there is no reason NOT to be correct, and there are no real ramifications either way. Now, before anyone questions why the degrees symbols, ie. Degrees of Temperature and Degrees of Angle don't look the same, well, I'll give you the mail: It's purely an aesthetic choice. It does however make me think about degrees. Why the Heck do we have degrees, using the same symbol for heat or an angle? Is there a relationship that I don't understand? I only went as far as Year 11 Physics, which I failed.